وجه العملة تمثال للملكة اليزابيث الثانية وعبارة "اليزابيث الثانية 200 دولار 2007"
ظهر العملة Several maple leaves meant to replicate the infamous million dollar Maple Leaf gold coin minted by the Royal Canadian Mint. تمثال للملكة اليزابيث الثانية وعبارة "اليزابيث الثانية 200 دولار 2007"
1 أوقية 2017 من العملات الذهبية 99999 من دار السك الكندية Order your 1 oz 2007 Canadian Mint 99999 gold coin from our store online for the very lowest price. This unprecedented offering contains the highest gold purity of any bullion coin on the market and was produced as a display of the mint's exceptional detailing, engineering and design excellence, as well as its remarkable metal quality. The coin's reverse mirrors that of the $1 million, 1 kilo coin also made by RCM, with a reeded edge and exquisitely detailed, multi-leaf design. Also on the reverse, the Canadian legend, as well as the coin's purity, weight and metal content. The obverse bears artist, Susanna Blunt's well-known, youthful effigy of Elizabeth II. You'll also find Elizabeth II's name, the coin's year of issue and its unusually high denominational value on the reverse. With only 30,848 of these immaculate coins in circulation, they are extremely sought after and represent a sound buyer's investment. 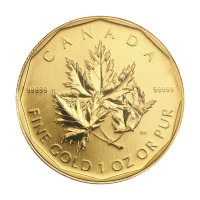 Pay homage to the beautiful nation of Canada and seriously upgrade your portfolio with the magnificent 1 oz Royal Canadian Mint 99999 Gold Coin today.